This training courseware title provides everything you need to professionally deliver Public Speaking: Presentation Survival School training including editable training manual, hands-on exercises, exercise files, detailed instructor guide, classroom-ready PowerPoint slides, and unlimited online learning licensing. 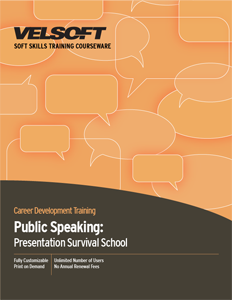 Seeing is Believing This sample manual to teach Public Speaking: Presentation Survival School is in MS Word format. Presentations are dynamic, active affairs that are often terrifying, especially for someone who hasn't had much practice, or who's preparing to give a presentation to their superiors. Knowing how to make a good impression, ensuring that your technology works, and being comfortable in your own skin-that's a lot to keep on top if, let alone to train! Velsoft's presentation skills training material teaches students how to build their confidence, speak with assurance, and improve their presentation skills with courseware that's easy to customize, or can be taught as-is. Public Speaking: Presentation Survival School includes an instructor's guide, student guide, activities, course assessments, and more, providing a full two days' worth of training on presentation skills. Trainers can also combine their courseware with eLearning, a blended learning solution that enables students to study online and improve their public speaking abilities at their own pace. At the end of the course, students will be able to organize and present their material with energy, enthusiasm, and confidence!